In light of Russian Prime Minister Dmitry Medvedev’s recent statements (http://cropcirclesresearchfoundation.org/?p=2562), we can now feel even more certain that the story below did happen. This event occurred in 1993, almost 20 years ago. If our military had this technology 20 years ago we all would know about this by now. This was a gigantic, silent aerial craft from somewhere else – not of this Earth. The energy and propulsion systems which kept this UFO in the sky and enabled it to accelerate away so quickly might be extremely useful and possibly even a planet-saving energy technology if it were intensively studied by our best scientific minds. For our best scientific minds to have the opportunity to study this technology, we must first acknowledge that UFOs are real, that they cannot be of human origin, and that their technology may offer a way out of the fossil fuel trap in which we and planet Earth are presently ensnared. 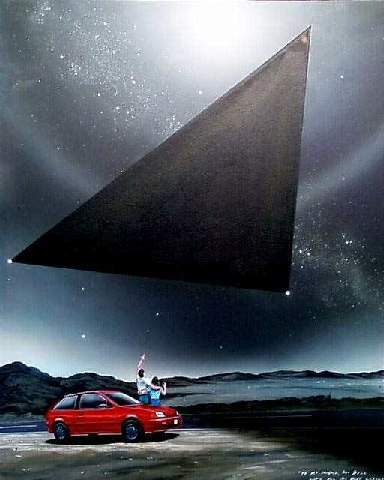 It is our choice – we can either keep saying “Oh that Dmitry Medvedev, what a joker” and we can keep on denying the UFO/ET reality, or we can demand that our political and military leaders tell the world the Truth about UFOs and ET visitation to this planet. Dmitry Medvedev, the current Prime Minister of Russia, had the courage to tell the Russian people the Truth. It is past time for our own political and military leaders to step up to the plate of Truth. I am grateful to the man who decided to share this story of what had to be for him and the other witnesses a life changing event. This story was recently published at UFO Casebook. My thanks to B.J. Booth (www.ufocasebook.com) and to Peter Davenport (www.nuforc.org) for the tireless work they do every day as they attempt to awaken our world to a new reality. Lesson # 1: Do not stand directly under a UFO! I was a State Trooper working the night shift and was patrolling US83 south of Canadian, TX. It was around 10:30 PM local time. I always had a citizens band radio on and had been listening to two truck drivers enjoying a conversation. It was an unusually warm evening for a winter night, and I was wearing short sleeves and had the car window cracked a bit as I slowly patrolled northbound. The radio was silent for a few seconds and then I heard the second trucker say “I nearly ran into you when you stopped. Are you pulling over?” To which the other trucker said “Hell yes… I want to see it”. I remember thinking this because I’d been down the dirt road that runs from this location west and was fairly familiar with the topography here and I could make out it was over another hill. I was afraid I’d be run over from behind so I started to park my patrol car on the shoulder beside the first truck. I could see the second driver running to the first one and pointing at the object. At this point, a small passenger car topped the hill just north of us and started slowing down; probably from seeing the two trucks and my car parked there. But as the car passed by I saw the brake lights come on and the car slightly screeched to a stop right in the middle of the south-bound lane. There was a female driver and she stepped out of her car, right foot still inside, but standing outside the car, and was looking at the object. I asked her to quickly move out of the road. She turned to me and said “What is that?” I told her I didn’t know, but to please move. She did so quickly and then came back to us. Now there were the two truckers, the lady and myself standing on the shoulder of the southbound lane. I couldn’t hear a sound from the craft but could see an immensely bright beam of light shining straight down. The light didn’t sway back and forth like a search light or anything; it just shone straight down. Suddenly I was aware of the fact that the object appeared to be moving toward us very slowly. This was because I realized the sheer dimensions of the craft. I realized no one was talking. I think we were completely confounded by what we were seeing. After around five minutes, the object had gotten to a point that I felt it was within a mile of us. I still had the strong sensation that it was higher above us than it appeared. That’s when the bright light simply shut off and it was easier to see the outline of the craft. The mere size of the craft was incredible. If my references are even near what I think they are, I’d estimate the size of the craft to be at least 1000′ per side. It was massive. The reason I use this word is twofold. One is from the dimensions of it. But the other is this: as the craft neared being almost directly over us, I remember feeling weight; it felt like something heavy on me. It also seemed as if there was a haze around the object, just barely off of the surface that seemed to make the stars near the edge flicker before they were occulted by the object itself. And although we couldn’t hear anything, one of the truckers said, “Do y’all feel that?” It felt as though everything, the road, the air, us; everything seemed to be vibrating. Up to this point, I don’t think what I felt was fear; just amazement. But when the craft was directly over us, something happened. I was staring straight up at it, and I remember at this point that the women started sobbing and ran away to her car. She left before I ever said another word to her. The object was black; much blacker than the sky. This may have been an illusion from all the stars in the background, but it was darker to me. But as I looked up, I suddenly saw a circle appear; just forward of what would be the center of the object. This circle didn’t light up. It became darker; as if there was absolutely no light shining from it or reflected from it. Without a doubt it was darker than the rest of the craft. The craft then started pivoting above us with the point moving clockwise in relation to me until it was pointed in a generally northwest direction. Then it began moving again. I remember hearing one of the truckers talking, but my ears felt as if they were going to pop. Again, there wasn’t a sound from it, but a tremendous feeling of weight or pressure, sort of like when you dive deeply into the water; that kind of feeling. As the craft moved off slowly, one of the drivers said something about driving to the top of the next hill to see it more clearly. He started to turn away and at that moment the craft sped up noticeably, and then shot off to the northwest in a matter of 3-4 seconds. We all got out again, but couldn’t see anything. I remember my ears were ringing like mad. Looking back, I think this was side effects of an adrenaline rush. I’ve been in shootings, high-speed pursuits and numerous other tension-filled moments and I always have that reaction. After some time, we all got in our vehicles and left. I went straight home. I undressed and took a shower. I still could see the object in my mind and am absolutely convinced about the darker circle inside the craft. I then sat down at my desk in the study and sketched out the craft on a piece of paper. I then went into my bedroom where my wife was asleep. As I lay down, she rolled over to kiss me goodnight but stopped and asked “Have you been fighting a grass fire or something?” I said no and asked why. She told me I smelled like burned grass or hair. I told her what I’d seen just an hour earlier. She knew I was sincere. The next morning I got out of bed and walked into the bathroom. As I looked in the mirror, I saw that my face looked like I had a very light sunburn. Not deep red; just a little blushed. I looked down and most of the hair on both arms looked as if I’d been singed with a flame. I called my wife and she came in and gasped at how I looked. We looked in the bed and there was a mass of burned hair on my pillow and the sheets. I say burned; I mean it was very brittle and it and I still smelled like I’d been fighting a fire. That was 12 years ago (at the time of his report). I still see it in my mind and I sometimes dream about it. I’ve never told anyone other than my dearest and most trusted friends. I have no doubt that what I saw was real. I have no doubt that it was huge, it was manned, and it was being intelligently operated. I’m not assuming anything; that it was an alien craft, a military craft or whatever. But what I saw moved with great stealth when I first saw it, and was able to reach an unbelievably high speed in the blink of an eye. So, as you’re reading this, you may think I’m nuts. But this is the single-most bizarre thing I’ve ever experienced, and I’m absolutely convinced it was real. I have no doubt that you are correct in believing that it was real sir. As a youngster of 16 in 1947 I was driving a John Deere tractor pulling a mold board plow that was set deep in the ground so that the tractor was laboring hard and making quite a bit of noise and I heard what sounded to me like a giant wood saw and when I looked up I saw a perfectly round object sitting still. I don’t know how high it was because I don’t know how big it was but it was making a very high pitched noise. I dropped the cluth and immediately stopped the tractor and lay down in the furrow to watch the thing. It just sat there for awhile and when it moved away I couldn’t believe the speed, it was out of sight in a split second. This was at a time when many UFO sightings were being reported all over the place and the press was crucifying all the people who reported the sightings so I didn’t tell anyone about it. I spent a career in the Army and then the Air Force and in 1965 and 66 I was in B-52 scheduling at Griffis AFB in Rome, New York and kept the book on “Fur trapper” high altitude refueling area. This was an area where we refueled aircraft from somewhere around Syracuse, NY on into the Northeast. Every now and again I would get a call from “Project Blue Book” at the Pentagon and they would ask me if we had any refueling taking place in “Fur Trapper” at such and such a time. We never did at the time specified but they did everything in their power to squash any report of a UFO, even to believing that you could see a colored light on the rear of the tanker the size of a dime at 28,000 or so feet! To make a long story a little shorter I’m a believer! 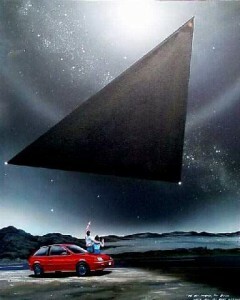 The Powers That be are deluding themselves if they believe they will be able to keep the Universe at bay forever. Your story is an interesting one. Anybody who had a similar experience would have no choice but to believe. Unfortunately, due to the deliberate cover-up of the UFO reality, you have had to live essentially your entire life knowing a Truth you could not share with anybody and everybody. The cover-up has severely hindered mankind’s social, spiritual, and scientific progress. It is time for it to end. Thank you for speaking up about what happened to you.